Last week, I took out tween reporters Maddy, Sophia and Olivia to Family Dollar’s Holiday Extravaganza event. We were given a challenge to shop for the holidays using $50 in gift cards provided. The girls were definitely up for it and started piling gifts for their siblings, cousins, amigos, themselves and the less-fortunate family their Girl Scout troop adopted into the cart. Mental math and carefully considering each item before placing it in the cart, the girls seemed to be doing well. UNTIL…the gentleman ringing them up declared their total was $50.47. QUE!?! He hadn’t even added the toys and candy the tweens picked out for themselves yet! As if all on cue, three girls’ tween heads immediately turned to where I was standing. With the sweetest of faces and puppy dog eyes, they asked me to pay the difference. Nope! I was standing my ground. They had a budget and they had to stick to it. Time stopped as the tweens tried to grasp the idea that they weren’t getting bailed out. Finally when they snapped back into reality, they put the toys back on the shelves. Sophia decided they didn’t need the wrapping paper. Olivia realized she could share nail polish with her sister. They added the candy and they were just under the $50 mark! AND, instead of llorando and complaining about the items they couldn’t get they were proud of themselves. They had successfully bought presents for everyone they wanted to, managed to stay under budget and didn’t get help from a parent – imagine that! 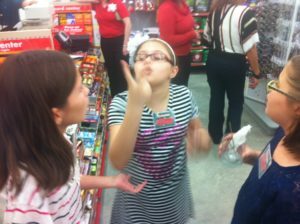 The tweens learned to shop within a budget and problem solve. This holiday season, I have a list and a budget with which I plan on sticking to. We’ll see if I do as well as the tweens. 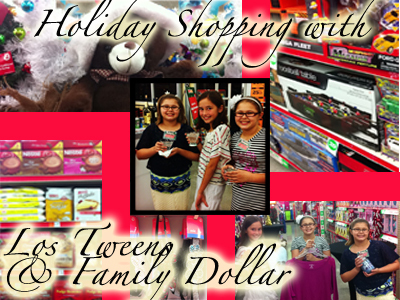 I was definitely impressed with all they managed to purchase at Family Dollar for under $50! Let’s see if I can follow my own lesson. Are you budgeting your holiday shopping? How are you teaching tweens about money? DISCLAIMER: Los Tweens was transported to and from the event, received $50 in gift cards to spend while there and a goodie bag for attending. All opinions expressed are our own. This entry was posted in #Shopping, Holidays, Ideas and tagged Brave, Family Dollar, financial literacy, holidays, parenting advice, shopping, Tweens. Bookmark the permalink.